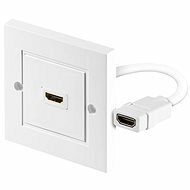 This excellent data socket has six RJ-45 connectors with shielded ports and can be wall-mounted. The self-tapping contacts allow easy and quick installation of cables without the use of a special tool. The socket makes it easy to connect to a network not only in companies but also, for example, in restaurants and cafes. It is designed for use with Category 5E STP shielded cables. For shipping to other EU countries visit this page Datacom, CAT5E, STP, 6x RJ45, surface-mounted. Für Versand nach Deutschland, besuchen Sie bitte Datacom, CAT5e, STP, 6x RJ45 an der Wand befestigte Datenbank. Chcete doručit zboží do Česka? Prohlédněte si Datacom CAT5E, STP, 6x RJ45, na omítku. Chcete doručiť tovar na Slovensko? Prezrite si Datacom, CAT5E, STP, 6× RJ45, na omietku. Für Versand nach Österreich, besuchen Sie bitte Datacom, CAT5e, STP, 6x RJ45 an der Wand befestigte Datenbank. Magyarországra történő kiszállításért tekintse meg ezt a termékoldalt: Datacom, CAT5E STP, 6x RJ45, falra szerelhető.